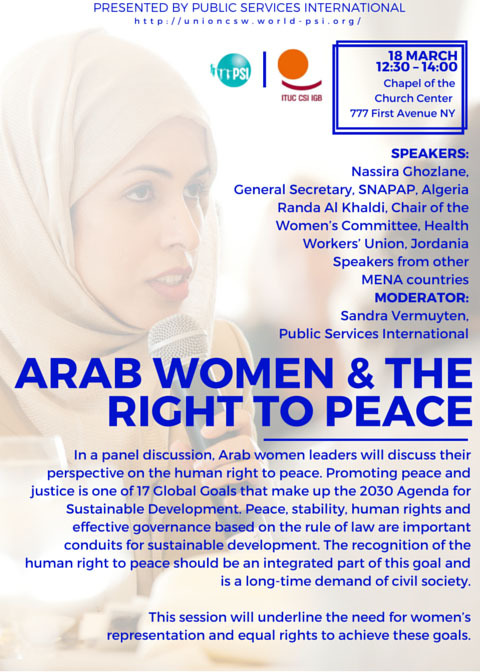 In a panel discussion, Arab women leaders will discuss their perspective on the human right to peace. Promoting peace and justice is one of 17 Global Goals that make up the 2030 Agenda for Sustainable Development. Peace, stability, human rights and effective governance based on the rule of law are important conduits for sustainable development. The recognition of the human right to peace should be an integrated part of this goal and is a long-term demand of civil society. This session will underline the need for women's representation and equal rights to achieve these goals.